Few machines represent The Future like the flying car, and no publication has championed the fantasy more zealously than Popular Science. Here's a look back at its feverish, 77-year-long vision. When Google Books announced that it had archived 137 years of Popular Science, we got giddy. With the exception of the unrelated Popular Mechanics, PopSci is as Jalop as mass-market magazines get — a bright-eyed, optimistic look at the art of the gearhead possible. (Full disclosure: They didn't pay us to say that. We just like rocket-powered cars and levitating trains and such.) And while a host of different vehicles have graced the magazine's cover, only one kind of machine has kept us coming back for more. We are hopelessly in love with the flying car. Walk through the gallery to read more of the story. Still, that dichotomy is what keeps the concept alive. A GBooks/Popular Science search for the phrase "flying car" brings up 28 issues of the magazine that contain the term. The articles are fascinating largely because they reflect the eras in which they were written: Wartime articles are filled with guarded optimism, mid-century stories bubble over with good cheer, and modern pieces offer a more careful, analytical approach. One of the earliest features, from May of 1933, refers to a levitating railway car. The most recent one, from October of 2008, refers to a "driving airplane." Both are filled with the same sense of giddy wonder. But as the nation changed, so changed the fantasy. While the middle part of twentieth century saw America trade its technological innocence for a reasoned, weary skepticism, the flying car remained. What began as a disconnected flight of fancy — a "Hey, look! We can do this!" moment — evolved into a more practical approach to the transportation problem. Predictably, the concept is held dear by car enthusiasts. We spend our lives constrained by traffic and artificial pathways, reined in by a host of factors outside our control. Airplanes can set us free, but they are complex, intimidating beasts; a car that can fly is somehow more approachable. We find ourselves ignoring the idea's obvious flaws because the possibilities are so fantastically cool. Why does this matter? Why are we continually drawn to an idea almost universally acknowledged to be a non-starter? The reason is simple: It's in our bones. Americans are a restless people, and the airborne car builds upon the dream of manifest destiny. It represents untapped possibility and the notion that our world still offers, after centuries of development, a new kind of freedom. (General aviation also promises this, but we tend to fool ourselves into thinking that a flightworthy car would be more affordable and require less training to operate.) And although the dream is not new, it refuses to flicker and dim: According to a recent MSNBC poll, 90 percent of the country would buy a flying car if given the chance. "Why is the airborne car such an enduring dream? There's something tantalizing about the freedom of a personal transportation device unhampered by roads or traffic, particularly in a world where gridlock and invasive airport-security checks have become the norm. If history is any guide, we'll be seeing a slew of new personal levitating devices in coming years — if nowhere else, then in the pages of [this magazine]." 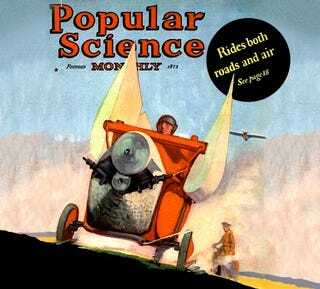 Perpetual optimism: It's what America was built on, and neither PopSci nor our air-car dream would exist without it. We endorse that kind of thinking — heck, the phrase "flying cars" was once part of this site's motto — even if it fails to produce results. In other words, we'll keep looking to the skies. Asphalt bonds, however strong, can't hold us forever. Don't forget to walk through the gallery above to read the rest of the story!